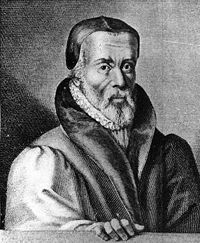 William Tyndale coined the word "atonement"
Atonement means that two parties, estranged from each other because one of them offends the other, eventually reconcile to each other. It usually contains two stages: 1) the offender's act of expiation for forgiveness from the offended party, and 2) reconciliation, which is a regained state of unity thereafter. Atonement in this sense, whether the offended party refers to a deity in the divine-human relationship or a fellow human person in the interpersonal relationship, seems to exist in every culture and every religion, although the word "atonement" itself, comprised of two parts, "at" and "onement," was coined in Christendom by William Tyndale, the maker of the 1526 English Bible, to express the nature of Christ's sacrifice better than "reconciliation," the English transliteration of the Latin word reconciliatio seen in biblical passages like Romans 5:11. Expiation takes various forms: sacrifice, fast, prayer, repentance, etc., depending on what culture or religion we are talking about. Atonement in its primary, religious sense is done very often in the presence of a priestly figure who appeases an offended deity on behalf of the offender. The High Priest in ancient Judaism and Christ in Christianity are examples. Christianity distinguishes itself from other cultures and religions in that it has Christ killed vicariously as an ultimate sacrifice for our atonement with God, while other cultures and religions don't have their respective priestly figures killed vicariously as sacrifices. Christianity is also unique because it usually teaches the need for the human blood of Christ, while other religions and cultures (except those ancient cultures which practiced human sacrifices) tend to have milder forms of expiation such as repentance and at most animal sacrifices. In Christianity the doctrine of atonement is very diverse unlike the doctrines of Trinity and Incarnation that were precisely defined and agreed upon by the early ecumenical councils. Historically, it was not formulated with that same level of precision, thus having many differing theories, depending on which aspect of the work of Christ is emphasized. There exist four major theories: 1) ransom theory, 2) satisfaction theory, 3) moral influence theory, and 4) penal substitution theory. Today, an increasing number of Christian theologians argue that none of the existing theories by itself makes sense fully, and that a new approach comprehensive enough to incorporate all the existing theories is needed to understand the whole picture of Christ's atoning work. Interestingly, this new approach tends to argue that Christ's sacrificial death was not absolutely necessary, making Christianity more compatible with other religions at least on two issues: whether or not the priest himself should die; and, more generally, whether or not the way of expiation should involve anyone's death. In ancient cultures, offering sacrifices through priests was normal and even necessary to please deities. The ancient Greeks for a long period of time practiced the ritual of animal sacrifices involving sheep, swine, goats, fowls, etc., in order to maintain their relations with the divine power. The ritual was done especially on the occasion of a wedding ceremony or at the ratification of an alliance pact between city states. People in many agrarian communities also sacrificed not only animals but also crops to appease the angry gods who they thought caused storms, earthquakes, and other miseries because of their wrongdoings. The Aztecs in Mexico in the Pre-Columbian era practiced human sacrifices very often based on their belief that since humans were created by the sacrifice of, and therefore are indebted to, the gods, they must reciprocate by offering human sacrifices. The ritual of human sacrifices was done in some other ancient cultures. Hinduism has a ritual of sacrifice, called yajna and more commonly practiced during Vedic times. It is performed to please the devas (gods), or sometimes, the Supreme Spirit Brahman, It involves pouring oblations into the divine Agni (the sacrificial fire). Everything that is offered in the divine Agni is believed to reach the gods. This ritual is typically performed by a priest, with a number of additional priests playing a supporting role, chanting Vedic verses. Often there will be a fire in the center of the stage and items are offered into the fire. Among the items offered include many coconuts, large quantities of ghee, sandalwood shavings and even quantities of clothing. Having a more explicit purpose of atonement than yajna is the practice of prayaschitta (penance). When people commit sins, violating the dharma - a value system that teaches religious and ceremonial duties in front of the gods and ethical codes on their relationships to their fellow human beings - they practice prayaschitta, involving fasting, chanting of mantras (religious syllables), charity, pilgrimage, etc., in order to atone with the gods and also with their fellow humans. This penance is also understood to help them toward their liberation from the karma, which causes their sins. Buddhism is far from theistic, so, it has no real concept of atonement with God. It rather focuses on atonement with fellow humans, teaching the importance of forgiveness. Even if you are offended by someone who commits sin against you, you are supposed to forgive him. So, atonement is initiated more by the offended party than by the offender. You are supposed to practice mettā (loving kindness), karuna (compassion), and mudita (sympathetic joy). But, the whole idea of forgiveness comes from the belief that it prevents both the offended and the offender from developing negative and harmful emotions from the karma that unfortunately binds them in sin and misery. According to the covenant with the people of Israel as presented in the books of Exodus and Leviticus, God allowed that obedience to the Law of Moses, fulfilling all its requirements, would grant the people privilege to the blessings of God. Knowing that the people would inevitably fall short and transgress the Law, God provided remedial actions, acts of repentance or repayment to be performed in order to reestablish a right relationship with God. Although some of these were penitential personal or social acts, what was done most often was the sacrifice by burning of material goods, animals and produce, as conditional objects substituting for the malfeasant person or people. God in his mercy did not want the transgressor to die, and accepted the sacrifice of the person's or his community's goods, including the death of an animal as the object substituted for the transgressor. A number of animal sacrifices were prescribed in the Torah (five books of Moses) to make atonement: a sin-offering for sins and a guilt-offering for religious trespasses. Rituals for atonement occurred in the Temple in Jerusalem, and were performed by the kohanim, the Israelite priests with the kohen gadol (High Priest) as their central figure. These services included song, prayer, offerings, and animal sacrifices known as the korbanot. The rites for Yom Kippur (the Day of Atonement), where kippur literally means "to cover" transgressions with blood, are prescribed in the sixteenth chapter of the book of Leviticus. The ritual of the scapegoat, sent into the wilderness to be claimed by Azazel, was one of these observances (Leviticus 16:6-10). Not all Jews believed that sacrifice paid the debt for sins. Biblical prophets occasionally make statements to the effect that the hearts of the people were more important than their sacrifices: "Does the Lord delight in burnt offerings and sacrifices as much as in obeying the voice of the Lord? To obey is better than sacrifice, and to heed is better than the fat of rams" (1 Samuel 15:22, NIV); "For I desire mercy, not sacrifice, and acknowledgment of God rather than burnt offerings" (Hosea 6:6, NIV); "The sacrifices of God are a broken spirit; a broken and contrite heart, O God, you will not despise" (Psalm 51:17, NIV). (See also Isaiah 1:11 and Psalm 40:6-8). Although animal sacrifice was prescribed for atonement, the Hebrew Bible does not say that it is the only means of atonement. It is possible to return to God through repentance and prayer alone. The Hebrew word for repentance is teshuvah which literally means to "return to God." Prophet Hosea said: "Take words with you and return to the Lord" (Hosea 14:2, NIV). Judaism teaches that our personal relationship with God allows us to turn directly to him at any time, as it says: "Return to me, and I will return to you" (Malachi 3:7, NIV); "But if a wicked man turns away from the wickedness he has committed and does what is just and right, he will save his life" (Ezekiel 18:27, NIV). (See also Ezekiel 33:11; 33:19) In the books of Jonah and Esther, both Jews and non-Jews repented, prayed to God, and were forgiven for their sins without having offered any sacrifices. With the destruction of the Second Temple in 70 C.E., the cult of burnt offering ended, but Jews could nevertheless offer prayers and repentance as the offering for atonement. Judaism also teaches atonement between individual persons. If a person harms another but personally apologizes and tries to rectify the wrong done, then the wronged person is religiously required to grant forgiveness for atonement. But if the wrongdoer does not apologize, then the wronged person does not have to grant forgiveness. Receiving forgiveness from the wronged person is one thing, and receiving forgiveness from God for the same wrongdoing is another. In Islamic theology, the animal sacrifices or blood are not directly linked to atonement: "It is not their meat nor their blood that reaches Allah. It is your piety that reaches Him…" (Qur'an 22:37). On the other hand, the sacrifice is done to help the poor, and in remembrance of Abraham’s willingness to sacrifice his son (according to the Muslims, Ishmael) at God's command. The Qur'an teaches that the main way back to God is through genuine repentance (tawbah in Arabic which literally means "to return"). Say: "O my Servants who have transgressed against their souls! Despair not of the Mercy of Allah: for Allah forgives all sins: for He is Oft-Forgiving, Most Merciful. Turn ye to our Lord (in repentance) and bow to His (Will), before the Penalty comes on you: after that ye shall not be helped" (Qur'an 39:53-54). Verily! Allah Accepts the repentance of those who do evil in ignorance and repent soon afterwards, to them Allah will turn in Mercy, for Allah is Full of Knowledge and Wisdom. And of no effect is the repentance of those who continue to do evil, until death faces one of them and he says "now have I repented indeed," nor of those who die rejecting faith: for them have we prepared a chastisement most grievous" (Qur'an 4:17-18). In many verses of the Qur'an, God also promises to forgive sins of those who believe, pray, and do good works (Qur'an 22:37; 47:2; 29:7; 14:23; etc.). The Islamic Law, sharia, specifies the expiation of any particular sin for atonement. Depending on the sin, it can range from repentance and compensation of the sin if possible, feeding the poor, freeing slaves to even stoning to death or cutting hands. Some of the major sins are held to be legally punishable in an Islamic state (for example, murder, theft, adultery, and, in some views, apostasy). Most are left to God to punish (for example, backbiting, hypocrisy, arrogance, filial disrespect, and lying). It goes without saying that the Qur'an also encourages atonement between believers. Acknowledging one's wrongdoing, apologizing, and repenting in front of the wronged person and in front of God can make possible forgiveness from the wronged person and also from God. Muslims are encouraged to forgive because God is the most forgiving. In Christianity, atonement between individual persons is important. So, forgiving others for their wrongdoings, especially if they apologize, is one of the spiritual duties of the Christian believer. But, this interpersonal atonement is understood to be possible because God loves and forgives us for our atonement with him. Christians believe that the love and forgiveness of God was expressed through the vicarious death of Christ on the cross. According to Christianity, atonement by Christ is necessary to compensate and reverse the fall of Adam and the subsequent condemnation of his offspring: "Consequently, just as the result of one trespass was condemnation for all men, so also the result of one act of righteousness was justification that brings life for all men. For just as through the disobedience of the one man the many were made sinners, so also through the obedience of the one man the many will be made righteous" (Romans 5:18-19, NIV). In this view, the human problem brought forth through the fall of Adam is not just occasional or even continual sinful acts, transgressions of the Law, as understood in the Torah. It is deeper than that; it is a fundamental separation or alienation from God. No quantity of righteous works carried out by men and women who are separated from God at their root can set this aright. The atonement for the very condition of our fallen existence in the world, given by birth itself, is beyond our power. It must come from God, and it did come by God entering the world in his Son who had a radically different birth than any other persons; he was born without sin, one with God. Thus Jesus was the "last Adam" (1 Corinthians 15:45, NIV). This unblemished "Lamb of God" could redeem us for eternal reconciliation with God. The Christian tradition, following the Jewish tradition, usually sees Christ as the High Priest making the offering for us. This is clearly set forth by the author of Hebrews: "When Christ came as high priest of the good things that are already here, he went through the greater and more perfect tabernacle that is not man-made, that is to say, not a part of this creation. He did not enter by means of the blood of goats and calves; but he entered the Most Holy Place once for all by his own blood, having obtained eternal redemption" (Hebrews 9:11-12). Note that this priestly mission of Christ involves "his own blood," i.e., his own sacrificial death on the cross, unlike in other religions and cultures where their priests do not go through their own sacrificial death. This priestly work of Christ, however, does not seem to be the whole story. For, as is commonly understood, Christ also has two other important offices: prophetic and kingly. In his prophetic office, he reveals God's moral and spiritual teachings to people (Luke 13:33; 24:19; John 8:26-28; 12:49-50; Matthew 24:3-35; etc.). In his kingly office, he is supposed to have his kingship over the whole universe including the powers of darkness in the world (Matthew 28:18; 1 Corinthians 15:24-28; Ephesians 1:20-22; etc.). When his prophetic and kingly offices are paid attention to, the centrality of his own blood for the atonement tends to diminish, and we are reminded that all other events in his life such as his victory over the Three Temptations and his Sermon on the Mount are also important for the atonement. We can realize this interesting point, by looking at various theories of the atonement suggested in the history of Christianity. Amongst many different theories of the atonement suggested historically, there are four major ones with their own respective emphases on one of the various offices of Christ: 1) the ransom theory, stressing the kingly office of Christ; 2) the satisfaction theory, focusing on his priestly office; 3) the moral influence theory, mainly talking about his prophetic mission; and 4) the penal substitution theory, again priestly. This theory maintains that Christ was offered as "ransom" (Matthew 20:28; Mark 10:45) to battle against and defeat the dominion of Satan. It is about defeating Satan's dominion, from which to liberate humans for their reconciliation to God; so, it points to Christ's kingly mission. The Incarnation took place for this kingly mission, and so did all the other events in the life of Christ, including his death on the cross. What is noteworthy in this theory is its understanding that all the events in his earthly life starting from the Incarnation were as important as his death on the cross for the atonement. The centrality of the cross is no longer here, although this does not mean to treat the cross as of secondary importance. This theory, developed by Saint Irenaeus (d. c. 200), Origen (d. c. 254), and other early Church Fathers, was the standard view from the second to eleventh centuries, but was forgotten thereafter because of the emergence and subsequent spread of a new atonement theory by Saint Anselm of Canterbury (d. 1109) within the Catholic Church. The ransom theory was temporarily restored by Martin Luther in the fifteenth century, but his followers did not accept it. It was only in the twentieth century that it was finally rehabilitated by Gustaf Aulén, a Swedish Lutheran. In his groundbreaking book, Christus Victor (1931), Aulén argues that with its emphasis on the kingly mission of Christ the ransom theory, which he also calls the "classic" theory, is so comprehensive as to be able to explain how Christ's victory over the power of Satan was the way to bring a difference to both God (our "object" of faith) and believers ("subjects" of faith) in their relationship, and not to God alone nor to believers alone. Established by Anselm of Canterbury in the eleventh century and further developed by St. Thomas Aquinas (d. 1274) later, the satisfaction theory focuses on the priestly mission of Christ. Christ played the role of the High Priest on behalf of fallen humanity when he died on the cross to "satisfy" God's honor that had been offended by their fall. In disagreement with the ransom theory, Anselm deleted Satan from his discussion of the atonement, saying that through our fall we became only indebted to God the Supreme Being and not to Satan. This new theory primarily tries to explain how the atoning work of Christ paid our debt to God, bringing a change to God, our "object" of faith; so, it is usually called an "objective" theory. And it does not pay as much attention to how any change has been brought to us, "subjects" of faith. According to Anselm, the death of Christ on the cross was the only way to pay our debt even more fully to God: "Nothing that man can suffer for God's honor, freely and not as an obligation, is more bitter or harder than death. Nor can a man give himself more fully to God than he does when he surrenders himself to death for His honor. Then he who wishes to make satisfaction for man's sin must be able to die if he wills it." The crucifixion of Christ, thus deemed absolutely necessary, is usually separated from all the other events in the life of Christ and treated as the only important element for the atonement. This theory, developed by Abelard (d. 1142), points to the prophetic mission of Christ. In opposition to the priestly view of Anselm that stresses the importance of payment of our debt to the satisfaction of God, the moral influence theory focuses on the occurrence of a moral awakening in us through a supreme "example" (1 Peter 2:21) of love and sacrifice prophetically shown by the death of Christ on the cross. It refers to a "subjective" atonement because it exercises an impression and influence on us, "subjects" of faith. It was adhered to by the Socinians in the sixteenth century. Because it presupposes the optimism of human nature and discusses the atonement in personal terms, it was later embraced by many nineteenth- and twentieth-century liberal theologians such as Horace Bushnell (d. 1876) and Hastings Rashdall (d. 1924). In this theory, the uniqueness of the blood of Christ tends to disappear because all the other events in his life such as his victory over the Three Temptations are deemed to be morally influencing us for the atonement. The penal substitution theory is the Protestant version of the Catholic satisfaction theory, thus pointing to the priestly mission of Christ again. John Calvin and other Reformers developed it. According to this, Christ was "punished" by the wrath of God as the "substitute" for fallen humanity. In order to perform his priestly work of appeasing the wrath of God for us, Christ had to die on the cross. In the words of Calvin: "the flesh which he [i.e., Christ] received of us he offered in sacrifice, in order that by making expiation he might wipe away our guilt, and appease the just anger of his Father." While the remission of our guilt as a result of the work of Christ is recognized in this theory, its main focus is on God. So, it is an "objective" theory. Today's Christianity has no authorized, agreed-upon doctrine of Christ's atonement. The diversity of doctrines is getting even greater through the emergence of several new versions of the classic ransom theory that argue that the original mission of Christ was not to be killed on the cross but to battle against the unjust and oppressive reign of Satan for the restoration of the reign of God. These new versions have been suggested by pacifists such as J. Denny Weaver, a Mennonite theologian, and feminist and/or womanist theologians such as Joanna Carlson Brown and Delores Williams, who dislike the patriarchal abuse of power in the name of the cross. They naturally collide with the widely accepted view of Christ’s death on the cross as the sine qua non for the atonement – a view integral in the satisfaction theory of the Catholic Church and in the penal substitution theory of the Reformation tradition. The increasing diversity of doctrines of the atonement is surprising, given the centrality of the work of Christ in Christian theology and life. So, it has prompted some theologians in the twentieth century to suggest ways to integrate them. Following the footstep of Gustaf Aulén, the Oxford theologian John Macquarrie, in his book on systematic theology, acknowledges that to fully comprehend Christ's atoning battle and victory over Satan, the classic theory should be recast to look at his whole earthly life and not just his death on the cross. If that is done, then the classic theory is the most viable theory because its focus on Christ's victory over the dominion of Satan does not make it predominantly "objective" nor predominantly "subjective." It is comprehensive enough to be able to go beyond the tension between the "objective" and "subjective" views and reintegrate them. Millard J. Erickson, an Evangelical theologian who personally prefers the penal substitution theory, says: "Each of the theories… seizes upon a significant aspect of his [Christ's] work. While we may have major objections to some of these theories, we recognize each one possesses a dimension of the truth." This is echoed even more strongly by John McIntyre, Professor Emeritus of Divinity at the University of Edinburgh, who surveys as many as thirteen different historical models of the atonement with equal appreciation to each of them and maintains that all of them should be retained to the exclusion of none because they mutually influence and condition one another within the coherent system of the work of Christ. Robert Sherman, a theology professor at Bangor Theological Seminary in Maine, proposes a constructive approach to harmonize the three main theories of the atonement in light of the Trinity. According to him, the three missions of Christ as King, Priest, and Prophet as treated respectively in the three main theories of the atonement (i.e., the classic theory, the satisfaction or penal substitution theory, and the moral influence theory), correspond to the roles of the Father, the Son, and the Holy Spirit, respectively, and as long as the three persons of the Trinity are united, the three theories of the atonement are also united. This comprehensive approach regards "the entirety of Jesus Christ’s birth, life, work, passion, resurrection, and ascension" and not just his passion as "redemptive." Various cultures and religions in the world have been practicing a variety of ways of expiation for atonement: animal sacrifices, human sacrifices, crops offering, fast, prayer, repentance, apology, charity, etc. Human sacrifices were practiced only in ancient cultures. Of course, outside ancient culture there have been some variations of human sacrifices such as: 1) revenge killing, 2) "harakiri" in the feudal system of Japan till the middle of the nineteenth century, and 3) death penalty in the past as well as in modern times. But, these were meant not to appease an angry god but rather to fulfill the requirement of a psychological need or an honor code or a legal system. In most cases, therefore, it has not been human sacrifices but other, milder ways of expiation that have been adopted. Thus, religions including Christianity usually teach the importance of the interaction between genuine repentance and forgiveness for atonement. Given this, the Christian teaching that Christ had to die on the cross as a sacrifice seems to be unusual. Christian pacifists such as J. Denny Weaver, therefore, believe that Christ should not have been killed. Also, the vicarious death of a priestly figure is absent in all cultures and religions except Christianity. Even the practice of human sacrifices in ancient cultures did not involve the death of a priest but only the death of those individuals selected to be sacrificed. In ancient Judaism, the High Priest himself was not sacrificed to shed blood. In a more secular context, harakiri in Japan only killed the wrongdoer and his associates, and also the legal practice of death penalty has only involved the death of the criminal. So, the Christian teaching on the vicarious death of Christ for sinful humans is exceedingly unique. For many Christians, it is exactly what makes Christianity superior to other religions. As was seen above, however, the centrality of the blood of Christ already seems to have been somewhat diminished at least in the classic theory and the moral influence theory within Christianity. And new efforts to integrate all the existing Christian theories reassess the cross from a more comprehensive perspective, saying that the cross was simply one of the many redemptive events that happened in the life of Christ. Furthermore, Christians from some quarters argue that Christ should have continuously lived on the earth to defeat the structure of evil for the purpose of regaining the unity of all the stakeholders including himself as well as God and human beings. If it is true that Christianity is a very special and unique religion, it may not be very fair to look at the Christian doctrine of the atonement in the context of the atonement practices in various other traditions in the world. In today's interreligious and international situation of the world, however, it may also be true that one cannot avoid an exercise of interreligious comparison on topics like atonement. ↑ Gustaf Aulén. Christus Victor: An Historical Study of the Three Main Types of the Idea of the Atonement, tr. A. G. Hebert (New York: Macmillan Publishing Co.,  1978). ↑ Anselm of Canterbury, "Cur Deus Homo?" II.11, in A Scholastic Miscellany: Anselm to Ockham, ed. Eugene R. Fairweather (Philadelphia: Westminster Press, 1956). ↑ "Institutes of the Christian Religions," II.xii.3, Christian Classic Ethereal Library. Retrieved June 8, 2007. ↑ J. Denny Weaver. The Nonviolent Atonement. (Grand Rapids, MI: William B. Eerdmans, 2001). ↑ Joanna Carlson Brown and Rebecca Parker, “For God So Loved the World?” in Christianity, Patriarch and Abuse: A Feminist Critique, ed. Joanna Carlson Brown and Carole R. Bohn (New York: Pilgrim Press, 1989); and Delores Williams, Sisters in the Wilderness: The Challenge of Womanist God-Talk (Maryknoll, NY: Orbis Books, 1993). ↑ John Macquarrie. Principles of Christian Theology, 2nd ed. (New York: Charles Scribner’s Sons, 1977). ↑ Millard J. Erickson. Introducing Christian Doctrine, 2nd ed., ed. L. Arnold Hustard (Grand Rapids, MI: Baker Academic, 2001), 254. ↑ John McIntyre. The Shape of Soteriology (Edinburgh: T. & T. Clark, 1992). ↑ Robert Sherman. King, Priest and Prophet: A Trinitarian Theology of Atonement (New York: T. & T. Clark, 2004). Anselm of Canterbury. "Cur Deus Homo?" In A Scholastic Miscellany: Anselm to Ockham, edited by Eugene R. Fairweather, 100-183. Philadelphia: Westminster Press, 1956. Brown, Joanna Carlson and Carole R. Bohn, ed. Christianity, Patriarch and Abuse: A Feminist Critique. New York: Pilgrim Press, 1989. Calvin, John. "Institutes of the Christian Religions." Christian Classic Ethereal Library. Retrieved June 8, 2007. Macquarrie, John. Principles of Christian Theology, 2nd ed. New York: Charles Scribner’s Sons, 1977. Williams, Delores. Sisters in the Wilderness: The Challenge of Womanist God-Talk. Maryknoll, NY: Orbis Books, 1993. This page was last modified on 6 December 2016, at 00:07.